COMFORT AND DURABILITY: Each pan comes with cool touch and ergonomically designed cast steel handles with a soft-grip silicone wrap for strength. 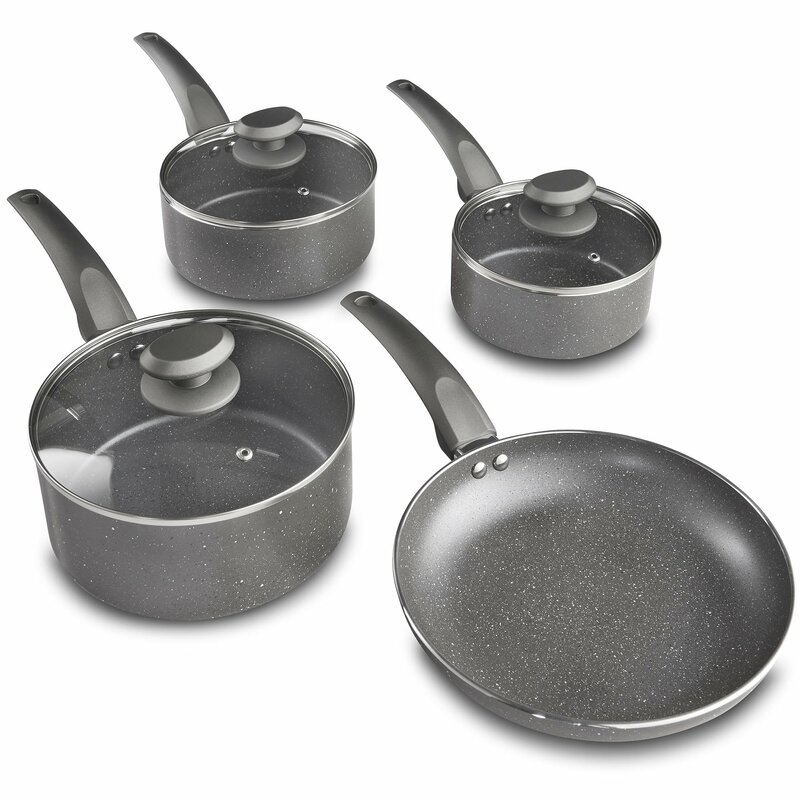 The ultimate kitchen essential, this comprehensive 4 piece pan set is designed to last. Modern and practical, the set comprises 16cm, 18cm and 20cm saucepans and a 24cm frying pan. Each pan is made from premium 3.5mm aluminium for strong, long-lasting performance. Finished with a marbled effect coating for extra durability, the set perfectly matches the VonShef Marble Wok and Sauté pan, ideal if you want to expand your collection. Offering safety and strength, each ergonomically designed handle is made from durable cast steel, whilst the added silicone wrap ensures it’s cool to touch. Never battle with burnt-on foods again. With a fully non-stick interior, foods won’t stick or cling to the pan base – making it extremely easy to clean. Made with everyday cooking in mind, this set is designed to be your go-to for everything from quick midweek meals to the famous Sunday roast. It includes a pan selection to suit all kinds of cooking tasks. When not in use, the pans nest within one another for simple storage – perfect if cupboard space is at a premium.The pans are suitable for all hob types – including induction systems. EASY STORAGE: Set sits seamlessly together for easy storage or attractive countertop display. Use on electric, gas, halogen and induction hobs.